Park City Beethoven Festival @ Park City Community Church. Park City, Utah, July 30, 2015. Concert review by Gregory Walz. The 2015 Park City Beethoven Festival, now in its thirty-first summer season, is Utah’s oldest classical music festival. Concerts are now given exclusively in Park City, in multiple venues, although for many years a small number of concerts were performed in Salt Lake City. 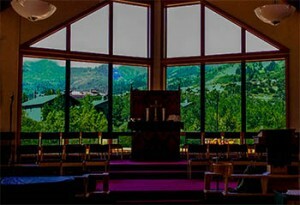 The venue for this reviewed performance was Park City’s Community Church. Attendance consisted of about forty people in the spacious, airy, yet cozy confines of one of two upper levels of the church. Four musicians were featured: clarinetist Russell Harlow, violist Leslie Harlow, pianist Doris Stevenson, violinist Monte Belknap, and cellist Cheung Chau. Russell Harlow is a fine clarinetist, a former member of the Utah Symphony for over three decades, and founder and director (until the mid-1980s) of the NOVA Chamber Music Series of Salt Lake City. Leslie Harlow studied viola at the Julliard School, and founded the Deer Valley Chamber Music Festival in 1983-1984. This festival is now (as of 2012) renamed the Park City Beethoven Festival. It was previously called the Park City International Music Festival. Leslie has played with the Utah Symphony’s viola section on and off for many years, but is not formally a member of the orchestra at this time. Her supple viola tone is sweetly and finely projected. Pianist Doris Stevenson taught at the University of Southern California for ten years, and has been playing with the festival for many years. She has contributed significantly with her cascading and flowing pianism. Monte Belknap, with a cool and precisely-colored violin tone, is on the faculty at Brigham Young University’s School of Music and has performed with the festival for several years. Cellist Cheung Chau is from Hong Kong, studied at the Colburn School of Performing Arts in Los Angeles, at Yale University, and the New England Conservatory in Boston. His cello tone is often on the lighter side and is softy-shaded. First on the evening’s program was the Austrian composer Franz Schubert’s Sonata in A minor for Viola and Piano D.821, known as the Arpeggione. This piece was written in November 1824, towards the end of Schubert’s life (1797-1828). It was played by violist Leslie Harlow and pianist Doris Stevenson. Although he contributed most prominently and prolifically to the German Lieder (song) genre of composition, today Schubert’s chamber music is performed quite often, especially some of his string quartets and his Piano Quintet in A Major D.667, popularly known as the “Trout Quintet.” The Arpeggione Sonata is less frequently performed, and has been transcribed for violin and piano, viola and piano, and cello and piano, and is usually performed in one of these three transcriptions, although ones for other instruments have been made. The arpeggione was more or less a bowed guitar, and this piece is really the only substantial surviving composition for that instrument, which rapidly went out of fashion. The composition lasts about twenty-four minutes. The first movement, an Allegro moderato, had a silken restraint that benefited the glancing lyricism, yet the rhythms were still finely delineated. Stevenson’s filigree playing left both players opportunities to exhibit an admirable restraint. The second movement, an Adagio, was almost lullaby-like in its phrasing, strongly projected, yet with warmth and a hint of brittleness. There was an exquisite balance in the most inward lines, and a searching pulse was valiantly sustained. The third movement, an Allegretto — well this had a sense of sense of folk-like showmanship to the phrasing, pointed clarity to the colors, and naturalness to the passionate essaying of lyrical lines. The undulating harmonic lines were projected roundly and decisively. Each player knew how to recede or intrude into the background or foreground. Overall, this performance was defiantly comfortable rather than anguished in its interpretation, which suits the narrative arc of the piece. Undercurrents of deeper nostalgia were at least hinted at though. There followed Hungarian composer Béla Bartók’s Contrasts for clarinet, violin, and piano. Bartók, one of the most important twentieth-century composers, lived from 1881-1945, and died in New York City. Commissioned officially by the great twentieth-century clarinetist Benny Goodman, Contrasts was composed in 1938 and first performed in April 1940. It is not played all that often. Performances of Bartók’s chamber music are dominated by his six string quartets. In the third and final movement of Contrasts, two clarinets are used, each in a different key. The B flat one, used second, has a warmer sound than the one in the key of A. An intentionally mistuned/retuned violin is also played briefly in the third movement. This work lasts approximately seventeen minutes. Contrasts was played by clarinetist Russell Harlow, violinist Monte Belknap, and pianist Doris Stevenson. The first movement of Contrasts is Verbunkos, or “Recruiting Dance” with punchy, earthy harmonies laden with color. The musicians unveiled an elastic yet vibrant pulse, and appropriately wayward sounding rhythms. Transitions in texture were handled in a mellow and convincing fashion. The second movement is Pihenő, or “Relaxation,” and is marked Lento. In its continued mood of dark-lit colors, which were warmly conveyed by the musicians, the push and pull of the harmonies was aptly caught. The soft dynamics were mastered, especially in the piano playing. A little mirage of coalescing harmonies spiked the ending. The third and final movement is Sebes, or “Fast Dance.” Here, gracefully emphatic, playful phrasing was a real high point of the performance overall. This helped to again bring out the harmonies, like a pond of cosmic light. Briefly, there was perhaps some loss of color in the faster section closer to the end of the movement. Yet the fervor of the lyricism was stressed in an undeniable and powerful manner. The final composition on the program was German composer Ludwig van Beethoven’s Piano Trio No.6 in E flat, Op.70 No.2. This trio was published in 1809. Monte Belknap played violin, Cheung Chau was on cello, with Doris Stevenson at the piano. The duration of this work is about half an hour. Beethoven wrote twelve piano trios, and additional pieces for the combination. They appear frequently on chamber music programs. While Op. 70 No.2 is classified as “Middle” period (circa 1803-1812) Beethoven, and was written just after Symphony No.6, the “Pastoral,” it does not upend the heavens, and is pleasantly diverting in its insistent musings. This piano trio was dedicated to Countess Marie von Erdödy; Beethoven was staying at her estate when he composed it. The first movement includes a Poco sostenuto and then an Allegro non troppo. A rather unique combination of darkly and brightly lit colors weaved a slowly entrancing spell with flashes of playful brilliance. At times there was almost a too robust of an overall tonal projection. The violin and cello were not so well matched on the sweeter side of tones, and the cello was especially anodyne, with some feeble coloring, at least as projected into the benches of the venue. Yet cello and violin lines at times merged and separated colors deliciously. The phrasing towards the end was rapturously declamed. In the second movement, an Allegretto, the darting interplay at the start was forceful and shaded. The brief call and response of the piano was almost haunting. The cello pizzicato line with rocking rhythm caught my attention — here the performance began to become more intuitive. Deeper chords of the piano drove the rhythms with confidence, and the pianism became more distinctive in its pearly tone. An Allegretto, ma non troppo, the third movement’s song-like feeling was captured with more focused and less carefree playing. There was a twinkle to the piano articulation, with brief moments of less thought-through interpretation. It all ended in an idyll of stillness and gently oscillating colors. The fourth and final movement is marked Finale: Allegro. Dancing colors were accentuated at the start. This, along with the second movement, was the most successfully interpreted, with palpably effervescent phrasing, and an almost bursting-at-the-seams feel to the lyricism. This was an evening of nourishing chamber music, with the Schubert and Bartók pieces vying for high honors, yet not much really lodging unobtrusively in this concertgoer’s memory. But the essence of each composition received its needed luster. This summer festival, which has just ended, is well-worth attending next summer season. Its spinoffs continue in a briefer fashion in autumn, winter, and spring. Watch for them. Such an articulate, absorbing, wish-I-had-been-there review. Walz writes with color and added history, always sending me directly to the stereo (assuming I have what he has reviewed in my collection) just to listen with his interpretation in mind. Wonder what he’d do with a rock concert? Just sayin’ (smile).